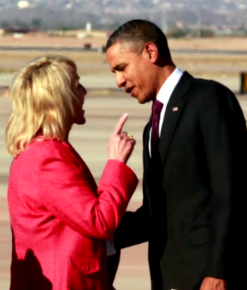 Arizona Governor Jan Brewer greeted President Obama on the tarmac yesterday in Phoenix. The two spoke intensely until Obama walked away angrily, cutting her off mid sentence. Jan Brewer told a White House press corps pool reporter, "He was a little disturbed about my book, Scorpions for Breakfast. I said to him that I have all the respect in the world for the office of the president. The book is what the book is. I asked him if he read the book. He said he read the excerpt." Sean Hannity discussed this incident on his Fox News talk show last night and asked Gingrich his take on the situation. Gingrich responded: "Well the thing that's fascinating when I read the story, you know Governor Brewer is telling the truth because he acted as arrogantly and as rudely to her on the tarmac as she suggested he had in the Oval Office. That wasn't the behavior of a man that said, 'Gosh, I'm sorry you felt that way.' She described him as lecturing her in the Oval Office, and what do we see at the foot of Air Force One? He's lecturing her. So you know that her version is right, and it tells you how thin-skinned and utterly unable to relate to other people President Obama is."